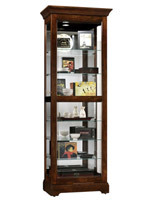 This Display Cabinet Features Locks for Glass Shelves, a Halogen Light, and a Glass Door That Slides Both Ways! 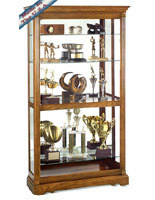 This Display Case Is a Cherry Wood Finished Display Case! 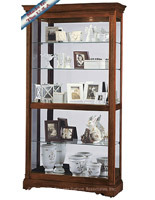 This Display Cabinet Is Sold Here! 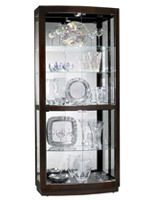 A No-Reach™ Touch-Lite™ located on the collectible cabinet back to provide easy access to lighting. 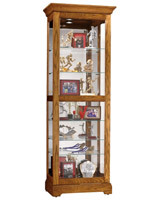 A side-to-side sliding, locking door to provide easy access to, as well as security of, your collectible items. 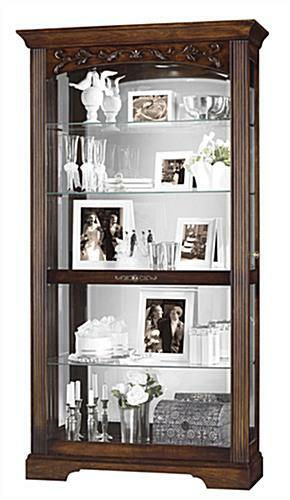 A glass, mirrored back to enhance your collectible's appearance. Fully adjustable shelves with Pad-Lock™ cushioned metal shelf clips for added stability. Interior halogen lights provide a whiter, brighter, more natural looking way to showcase your collectible items. Plate grooves to ensure dishware safety. 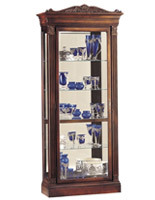 This curio cabinet furnishes a uncomplicated, elegant means of exhibiting family treasures. 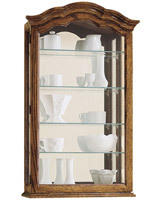 It is of outstanding heirloom quality, crafted by the famous Howard Miller Company. 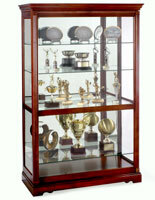 The display cabinet combines intricate woodwork with a rich Hampton Cherry finish. 42.0" x 78.0" x 17.5"